There is also a famous Disney short of the story. This text is an adapted reproduction of a module written by Madeleine Lifsey for Teaching Children Philosophy, a project Story Philosophy contributes to through translations and original contributions of picture book based philosophical discussion modules. Our society puts a lot of emphasis on teaching children to make “ethical choices,” but it would be difficult for any of us to determine a clear set of criteria that makes an action “right” or “wrong” each time. The Story of Ferdinand is an example of a young protagonist who grows up very comfortable in his own skin and with his own decisions, but is soon confronted with difficult situations that challenge his peaceful way of life. 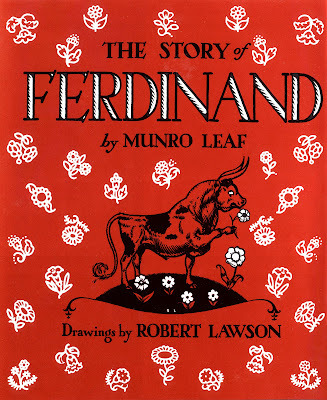 Young children can use Ferdinand’s story to confront their own questions about ethical dilemmas. Each question set deals with the larger issue of how we make choices in our interactions with others, but this question can be broken up into more specific topics. Looking at how the men interact with Ferdinand can spark a discussion on Animal Rights. The next three topics deal with Ferdinand’s choices, rather than the men’s. Ferdinand’s passivity informs a discussion on Violence. Considering why Ferdinand does not follow the other bulls’ example of rough play leads to a discussion on Conformity. Finally, examining why Ferdinand does not follow the men’s orders leads to a discussion on Obeying Authority. The first question set deals specifically with interactions between species. Our society teaches us that humans have the right to use non-human animals for our own purposes as we see fit. Most humans view themselves as somehow “higher” or more important than all other animals, but they have a difficult time justifying why they feel this way. Does this concept need to be re-examined? Most students will agree that Ferdinand should not have been taken away and hurt, but they may disagree about whether or not his species makes a difference, and if so, why. If Ferdinand were a human, there would be little debate that the abuse he suffers is a crime. However, many reason that species membership is an arbitrary distinction that should not be the basis for how one is treated, no more than should race, gender, ethnicity, and so on. Illustrating this standpoint, philosopher Jeremy Bentham, the founder of modern utilitarianism, maintained that the question is not “‘Can they reason?,’ nor ‘Can they talk,’ but ‘Can they suffer?’” Contemporary philosopher Peter Singer agrees that while species membership is not a distinguishing moral characteristic, sentience – that is, self-awareness and ability to suffer – is. We know that non-humans suffer acutely, both physically and mentally – for instance, mother cows will bellow hysterically when their calves are taken away from them, showing clear signs of distress long afterwards. If we agree that taking Ferdinand from his mother and his home and hurting him for our entertainment is wrong, then we must ask ourselves whether it is ever okay to exploit animals – for our entertainment, for our clothing, for our cosmetic products, for our food, or for anything else - and if so, how we decide when and why it is okay. Ferdinand wants to stay with his mother and sit quietly under his favourite tree, but the five men come and take him away to hurt him and make him fight. How do you think the men were able to make Ferdinand come with them even though he did not want to? Were they right to do this? Why or why not? Does being able to do something mean you should do it? Why or why not? If not, what is something you could do but should not do? Why? Are animals here for our entertainment? Do we have a responsibility to respect and/or to protect animals? What is more important: What Ferdinand wants to do, or what the fighting men want him to do? Why? If Ferdinand were a human being, would your answer be different? Why or why not? If someone hurt a person who has the same skin color as you, would you be more upset than if someone hurt someone who was very different from you? Would it matter if they were shorter, taller, younger, or older than you? Why or why not? Which would make you more upset, someone hurting a close friend of yours, or someone hurting a stranger? Why? Why do some kinds of differences seem to matter when we decide how we treat each other, while other differences do not? When the men come, Ferdinand is calm because he assumes they will not choose him, but when a bee stings him and he bucks, the men take him away. Why do the men believe that Ferdinand is fierce? Can we know what someone is thinking or feeling just by watching his/her behavior? Do you ever think you can tell what your pets are thinking? If so, how? If not, why not? Do the men ask how Ferdinand feels? Should they? The second question set deals with violence in general, which should certainly be considered regarding interactions between humans and non-humans, but also among humans themselves. Children are taught from an early age “don’t fight,” but it is sometimes difficult to tell what this means. What about in self-defense? In considering Ferdinand’s reaction to the violent men who want to “stick” him with pins and spears, students can debate ways to respond when someone else initiates a fight. Some argue that once someone has been provoked, any kind of violence can be justified if committed in self-defense. Others maintain that violence is never acceptable. For instance, many advocate ahimsa, or “no harm,” a Sanskrit term that is the foundation of many Eastern philosophies. A subscriber to ahimsa, like Mahatma Gandhi, a peace activist and celebrated pioneer of passive resistance, would maintain that a nonviolent response is always more appropriate. While we teach the general mantra, “don’t fight,” television, video games, and other forms of entertainment tend to portray a violent lifestyle as the norm and as something to admire and emulate. Sometimes some forms of “fighting” can be healthy forms of play, like when children wrestle together. However, does this mean that there is something wrong with not enjoying rough play or violent video games? Parents and educators have been disputing through the ages whether violent play and entertainment is healthy or not; here is a chance for children to add their voices to the debate. Everyone in the story except for Ferdinand and his mother enjoy fighting. Why didn’t Ferdinand enjoy fighting? Do you think certain types of fighting can be fun? When and how? Why or why not? Is fighting ever the right thing to do? Is it ever the wrong thing to do? When? How do you know? Is it ever okay not to fight back when someone wants to fight with you? Why or why not? What should you do if you don’t want to fight, but someone tries to start a fight with you? Do the answers to questions #2-#5 depend on whom you are fighting? Does it matter if the one you are fighting is weaker or stronger than you? Can a fight ever be fair? What makes it fair or unfair? Explain. A big crowd comes to watch the men fight with Ferdinand. Have you ever had fun watching someone else fight? (hockey, wrestling, kickboxing – bullfighting!) What makes it fun? Is it still fun to watch if someone gets really hurt? Why or why not? Do you think the men’s fight with Ferdinand would have been safe for both sides? Why or why not? Is there a way to fight but make sure that no one gets hurt? How is this type of “safer” fighting different from other kinds of fights? Are there rules in our school/community about different kinds of fighting? Do these rules protect you? How? Would you ever want to change those rules? If so, what do you think should be the rules about how, why, when, where, and whom we fight? Explain. Should everyone have to follow the same rules about fighting? Why or why not? Children, especially males, often grow up socialized to believe that they should be “tough,” and this can manifest itself in a number of assumptions about how we should behave. Amidst a cohort of young bulls who like to beat each other up all day long, Ferdinand is the lone, sensitive bull who prefers to smell the flowers. At first, when Ferdinand’s mother sees all the other young bulls playing a certain way and sees Ferdinand behaving differently, she worries that something is wrong, but when she understands that he is happy, she relaxes. 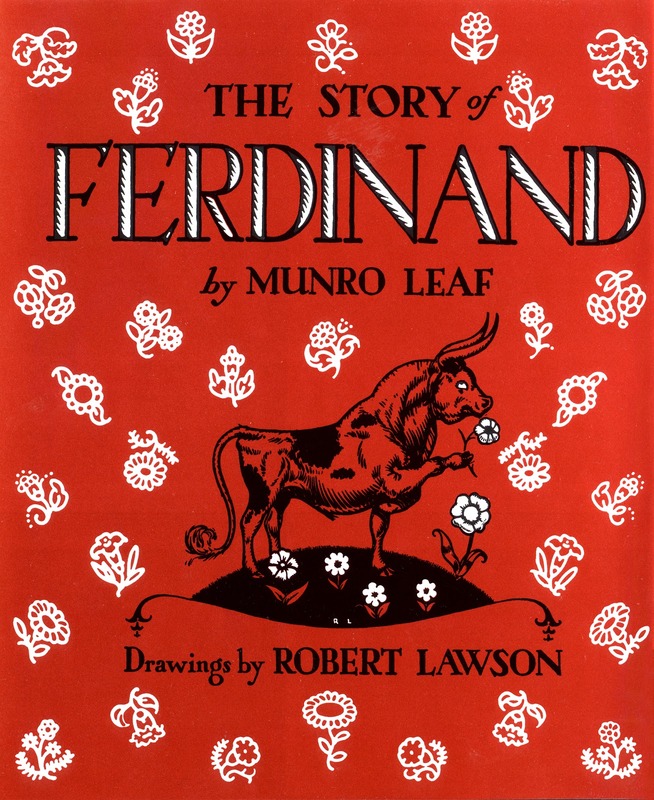 Ferdinand’s mother ultimately decides that it is okay for Ferdinand to be different, but her initial concerns reflect the underlying ethical question of whether there is something inherently good or bad about conforming to social norms. Some argue that social norms originate outside the self and thus should not govern how the individual behaves, while others maintain that social norms serve an important role in regulating our behavior to best serve the interests of society. Students will often decide that it is completely okay for two different groups (or a group and one “outlier”) to enjoy different things, but some may argue that it is important for peers all to behave the same way in certain situations. The discussion on conformity can focus specifically on peer pressure and bullying, which is especially appropriate in a school context and can be combined with the discussion on violence (see above). If everyone else around you is doing something, can you assume that it is okay? When phrased this way, it may seem that the answer is clearly “no.” However, given specific situations, our answers may become more complex. After all, we model our behavior on those around us, and so it can be difficult to determine when to follow and when to protest. One interesting activity would be to go around the circle and have each student think of a time in which they felt different from everyone around them. Most likely, everyone has felt this way at some point, and there will be those who feel this way most of the time. We could structure an entire session on the nature of “feeling different” and the ethical issues it raises. All of the other bulls with whom Ferdinand grew up like to run and fight, but Ferdinand wants to live peacefully. What do you think the other bulls thought of Ferdinand? Have you ever wanted to do something different than what all your friends wanted to do? How did you handle it? If you did what you wanted to do instead of what your friends wanted to do, did they make fun of you? Did you or your friends end up changing your mind? Have you ever felt different from everyone around you? What was that like? Is being different sometimes a good thing, a bad thing, or neither? Why do you think so? Why do you think people get upset so often when one person acts differently from everyone else? Can it be threatening to see someone behave or think differently than you do? Why? If a new student joined your classroom and every one of your classmates started bullying him or her, would you join in? Why or why not? Would you try to stop it? Why or why not? If enough people decide something is right, does that make it right? If enough people decide something is wrong, does that make it wrong? At the elementary level, children are just starting to grapple with the question of whether their caregivers are always right or have all the answers (and quickly learning that the answer may be a resounding no!) However, just because our caregivers are not always right does not mean that they are not generally excellent role models. How do we know when to listen to someone and whom to trust? Children may suggest many different criteria. For example, we trust people who we have seen do good things in the past, people who have more education that we do, people who are older than us, and so on. None of these suggestions is right or wrong; the important thing is that students can take it a step further to articulate why. Ferdinand’s story offers a springboard to discuss how we know whom to obey. The scary men tell him he must fight, but he disagrees. Was he right to do so, and why? 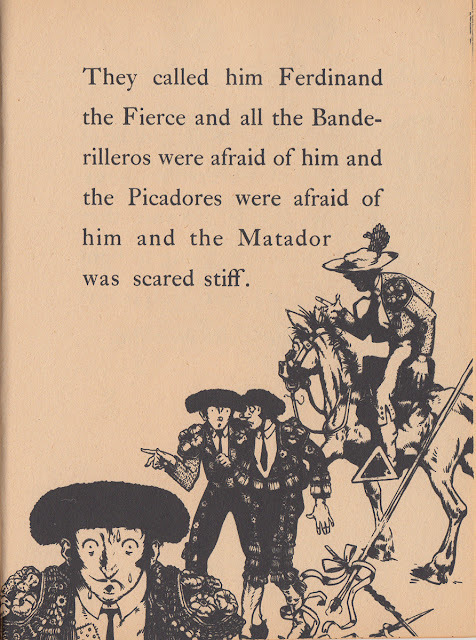 The Banderilleros, the Picadores, and the Matador are angry because Ferdinand will not obey them and fight. Should Ferdinand have listened to the men and fought them? Why did Ferdinand decide not to fight? What are some ways we try to decide whether something is right or wrong? If an adult you trust tells you to steal something, but you think that stealing is wrong, would you do it anyway? Do we trust certain adults [caregivers? educators?] more than others? Why or why not?